Rejection can conjure up feelings of genuine sadness, perhaps even anger and a low sense of self-worth. It’s a hard to pill to swallow when someone says that you’re just not good enough, that the dreams you invested your blood, sweat and tears into are doomed to fail. However, failure – more precisely, learning to accept failure – is a part of personal growth. One that we all must face at some point. Think back to a time when you failed at something, when someone rejected your ideas and wrote them off without even blinking. Each “third time’s the charm,” “if at first you don’t succeed, try, try again,” and “close but not quite” can become a long string of personal heartache. And while you may not be a weak person, there is only so much you can take before you just want to throw in the towel. It’s human nature. As isolating as the struggle that is failure and rejection can be, you’re not the only person who has ever gone through this journey. In fact, rarely does any successful person achieve their goals on their first try. For many, success only comes after failure. And often repeated failure. Walt Disney. His editor at the Kansas City Star felt he lacked “imagination,” and that his story ideas were less than impressive. He was fired from the publication. From there, he had several more business ventures that failed. It wasn’t until the premier of his first movie, Snow White, that his path to fame would unfold before him. Disney went onto create an empire built on imagination, quirky creativity and the definition of all that is good about childhood. Jay Z. As a young and rising star born in the Brooklyn projects, Shawn Carter couldn’t get a record label to sign him. When he failed to garner any interest on his first CD, he and his friends took to the streets and sold copies out of the trunks of their cars. Years of working to perfect his craft finally led to success, and being dubbed today’s King of Hip Hop. According to Forbes, the musician/investor/entrepreneur is now worth $550 million. Stephen King. He found himself writing his own horror story when he was rejected by publishers 30 different times when trying to publish his – now infamous – novel Carrie. At one point, he became so disgusted with himself that he literally “threw in the manuscript,” right into the trash. Luckily for King, and the rest of the world, his wife dug the manuscript out of the trash and encouraged him to keep going. The novel became a hit and launched his career as the King of Horror. His novels have sold 350 million copies over his career. Oprah Winfrey. Her first job in the spotlight landed her as a news anchor in Baltimore. That journey proved to be short lived, as she was fired for being too “emotionally invested in her stories.” She lacked the ability to deliver the story and move on, putting her news career in jeopardy early on. Little did her boss know that her compassion for others would be what propelled her to becoming the queen of talk shows. Winfrey has amassed a media empire – including HARPO studios which also produces the Dr. Phil show – and huge endorsement deals. Today, Forbes has estimated her net worth at $3 billion. Thomas Edison. One of the most important inventive minds of the 19th century was told by his teachers that he was “too stupid to learn anything.” His teachers’ predictions seemed to ring true, as Edison was fired from his first two jobs for not attaining a suitable level of productivity. Interestingly enough, being shunned from the working world was his ticket to success. Free from the handcuffs of societal standards, Edison’s creative genius was unleashed: He went on to hold more than 1,000 patents and invented world changing devices including the phonograph, electrical light bulb – which he failed at developing nearly 2,000 times – and a movie camera. Steven Spielberg. 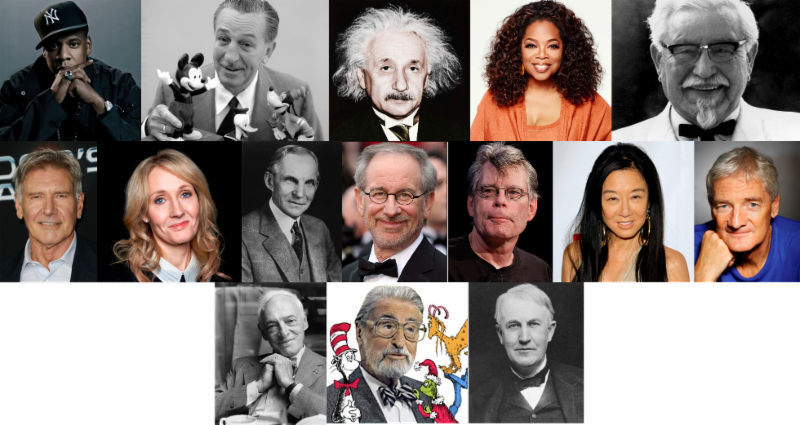 If Spielberg had taken the multiple rejections from the University of Southern California’s School of Cinematic Arts to heart, we may never have had the pleasure of seeing the world through his eyes. He powered through the piled up rejections, and released the summer blockbuster of 1975 with his movie, Jaws. His career has spanned decades, and includes three Academy Awards, four Emmys, and seven daytime Emmys. His 27 movies have grossed more than $9 billion worldwide. J.K. Rowling. When she began writing the first Harry Potter novel, she was a single mom living on welfare. It took a number of rejections before Rowling got a bite on her idea for the book series. In 1999, the first three installments of the Harry Potter series crushed the New York Times best-seller list. By the summer of 2000, the first three books had earned $480 million, with over 35 million copies in 35 different languages in print, with the fourth installment became the fastest selling book in history. The Potter phenomenon exploded from there. Rowling is now Britain’s 13th wealthiest woman – even wealthier than the Queen – and became America’s first billionaire author in 2004. James Dyson. If you thought Edison failing almost 2,000 times to make the light bulb was insane, then brace yourself: James Dyson developed 5,126 failed prototypes before finding the Dyson brand’s claim to fame. Not only that, he simultaneously dwindled away his entire savings account over his 15-year journey of failure. Luckily, prototype number 5,127 worked. Dyson has become the best-selling bagless vacuum brand in the United States. Forbes estimates that James Dyson is now worth $4.9 billion. Albert Einstein. During his childhood years, Einstein had a lot of difficulty communicating and learning in the traditional way that the rest of his classmates did. In fact, a 21st century Albert Einstein probably would’ve been diagnosed with a learning disorder. Obviously, behavioral and communication problems had no impact on his intellectual ability. Einstein went from problem student to Nobel Prize-winner in physics for his discovery of the photoelectric effect. His theory of relativity also topped the brilliant mind of Isaac Newton, and corrected the deficiencies of Newtonian Physics. Harrison Ford. He began his acting career with a small role in a movie, and immediately fell in love with dreams of stardom, fame and fortune. An executive who worked with Ford on his first movie was quick to yank him back to reality. He took Ford into his office and told him that he would never succeed in Hollywood. Just to prove the executive wrong, Ford built an acting career that has spanned 60 years. During his career, he has starred in some of the biggest blockbuster films in history, including Star Wars and the Indiana Jones series. Dr. Seuss. Born Theodore Geisel, the first manuscript from Dr. Seuss was rejected by 28 different publishers. Finally, world renowned publisher Random House saw the possibility of the places children could go and the creative genius behind a meal of green eggs and ham. Dr. Seuss went on to become one of the most successful authors of children’s books. His books have sold more than 600 million copies. Vera Wang. Her first failure came when she didn’t make the 1986 U.S. Olympic figure-skating team. Going back to her love of fashion, she did wind up an editor at Vogue magazine. Failure found her again when she was brushed off for the editor-in-chief position at the magazine. Wang decided to reinvent her life at the age of 40, and began designing wedding dresses. What started as sketches has grown her into one of the premier designers in the fashion industry, and a fashion empire worth more than $1 billion. Colonel Sanders. Before finding his seat on the throne as “The Colonel,” Harland David Sanders was fired from dozens of jobs – both in and out of the food industry. His quest to deliver fried chicken goodness to the people of America took him across the country looking for someone to see his vision and sell his chicken. Finally, a business deal in Utah proved that his recipe truly was finger lickin’ good, and thus Kentucky Fried Chicken was born. KFC is now one of the most popular food franchises in the world, and has over 18,000 locations. Henry Ford. Early in his career, Ford all but ruined his reputation with a handful of failed automobile businesses. Manufacturing automobiles in the 1890s was a daunting, time consuming and labor intensive task. When Ford couldn’t get it right, investors became aggravated and pulled their funding. After a long search, Ford finally found the right business partner who had faith in his vision. Proving the importance of learning from your mistakes, Ford went on to found the Ford Motor Company, forever changing the automobile industry with the creation of the assembly line. Saul Bellow. His dream was to touch the hearts of millions with the written word. However, his English professor, the famed Norman Maclean, quickly snuffed out that dream: He told Bellow that he showed no signs of literary greatness, and chalked him up to be a “dud.” Well, sure was one of the most successful “duds” of our time. He went on to win the Pulitzer Prize, the Nobel Prize for Literature, a Guggenheim, and the National Medal of Arts. Bellow’s other claim to fame is that he is the only writer to win the National Book Award for Fiction three separate times. He also received the National Book Foundation’s Medal for Distinguished Contribution to American Letters. Wise words from Aristotle. And a good reminder that what often separates success from failure is our own willingness to do what it takes to be successful. Yes, there are certain habits that separate the wealthy from the rest of the mortals. The good news is that these habits aren’t restricted to only a select few. With a little hard work, anyone can form the same habits of millionaires. Forming the habits for financial success doesn’t happen overnight, though. Ask any wealthy person how they got there, and they most likely won’t tell you that it was luck. Achieving financial success takes discipline – and constantly refining that discipline – throughout the entire journey. Discipline is how you get from Point A to Point B. One of the best ways to instill discipline is by forming and sticking to the habits that inch you closer to your destination. In many instances, the destination is always evolving for successful people. A critical component to the wealthy mindset includes a long-term view of success. Once they achieve one accomplishment, they are often onto the next soon after. For them, success has no expiration date; rather, it’s a lifetime process. Their journey is a constant mix of setting goals and cultivating the necessary habits to achieve them. Essentially, the long-term view helps keep successful habits in play over a lifetime. 1. Rise and grind. Successful people tend to get up early and get to work early. After all, the early bird gets the worm, right? The wealthy are always striving to get that worm – both pre and post-millions. They aren’t afraid to put in long hours of work to get it, either. At the risk of throwing in another cliché, Rome wasn’t built in a day. Neither is financial success. Millionaires are well aware of this, and maintain the habit daily to maintain their wealth. 2. Stay in-the-know. It’s hard to make smart financial decisions when you don’t know what’s happening in the world around you. We live in a global economy; an event on one side of the world can easily impact the other. Millionaires are never in the dark when it comes to current events, whether it be finance specific or general world news stories. They make it a point to read the paper, watch and/or listen to the news and look at market trends. 3. Find a hobby. Despite its appearance, the life of a millionaire isn’t all about making money. At least, a healthy lifestyle isn’t all about making money. To be successful financially or professionally, you have to be passionate about things that don’t come with a zero on the end. These interests give your life a deeper meaning, and re-energize your mind and body so that when you do go to work, you’re the best you that you can be. Whether its traveling, family time, boating, surfing or painting, millionaires know the importance of “me” time. 4. Follow the golden rule. Or in other words, treat others the way that you want to be treated. You don’t have to be a ruthless shark, ready and willing to take everyone around you down to be successful. Karma tends to creep up when we least expect it; burning bridges today can come back to you tomorrow. Try treating your colleagues and peers with the same respect you would want them to give you. Most millionaires have discovered that taking a humble approach has a greater impact in the end. 5. Reflect on the past. One of the most critical factors to reaching your full financial potential is the ability to learn from your past mistakes. There is no tougher critic on yourself than you. As a result, we will often keep gambling with our money to fill the void of financial loss or we may even forsake the market altogether. But if you can’t reflect on what went wrong and learn how to overcome past mistakes, personal growth is stunted. Millionaires often say the best lessons they learned were from themselves. 6. Keep going. The motivation to be successful can light a fire in all of us. The flame just burns brighter, stronger and longer in some people. For many millionaires, perseverance isn’t just a habit, but a way of life. Even after reaching their full financial potential, the drive to be successful doesn’t leave them. Their long-term view makes them well aware that there will be stumbles along the way, they may even fall. But they stick with it through the good and the bad. 7. Set and refine goals. To touch on an earlier point, setting goals for is a crucial ingredient for success. They’re the milestones that help you reach your destination. But, what happens once you’ve reached your destination? Well, many millionaires would tell you that nothing changes. Just because you’ve reached a certain level of financial success doesn’t mean it’s game over; there is more success to be had! Millionaires often revisit their goals, and refine them based on their current circumstances. Enacting all of these habits – or even one of them – doesn’t guarantee that you will become a millionaire. Not only that, but we all have different definitions of financial success; for some, becoming a millionaire may not be one of them. But there is a greater lesson to be learned here: We are what we repeatedly do. Forming successful lifetime habits can only increase your chances of reaching your full financial potential. Safety is always the #1 priority for our roofers. Evidence can be found through the use of harnesses, safety around the roof hatch, safety yellow applied to the rails and ladder cage, the ‘Warning’ sign glued to the inside of the hatch, and so on. 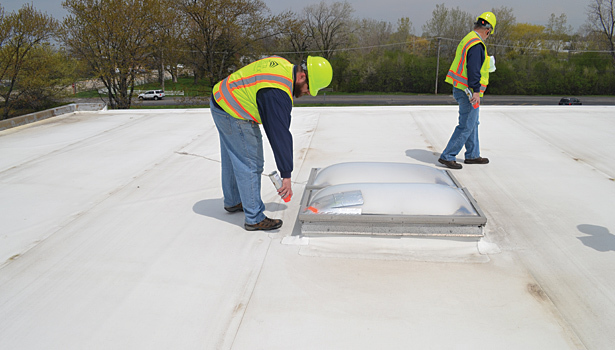 To prevent large issues arising in and on your commercial or industrial roof system, you should have a capable contractor perform a preventative and proactive maintenance plan. This plan will allow you to maximize the strength and resistance of the system, along with providing a great peace of mind. An effective plan should be scheduled every 6 months, or at the beginning of the spring and the end of the fall, as the weather drastically changes.